1. Preheat the oven to 200˚C, gas mark 6. Put the chicken in a bowl, add the cumin, chilli powder and a pinch of salt and mix well. Turn into a roasting tin and bake for 15 minutes or until the chicken is cooked through with no pink meat. 2. 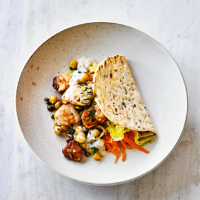 Stir the chickpea, spinach and quinoa mix in with the chicken and return to the oven, placing the flatbreads on the lower shelf. Cook for a further 5 minutes. 3. Place the flatbreads on warmed serving plates and top with the lettuce and carrot. Pile the chicken mixture on top and drizzle with the dressing to serve. There are several other tasty Love Life packs that are also ideal for this recipe, such as Bulgur Wheat, Quinoa & Rainbow Vegetables.